Shirts With Random Triangles: Virginia Tech And Maryland Agree To Four Game Series Starting In 2026. Plans call for Maryland to host the series in 2026 and 2028, while Virginia Tech will host in 2027 and 2029. Virginia Tech last faced Maryland in 2013. 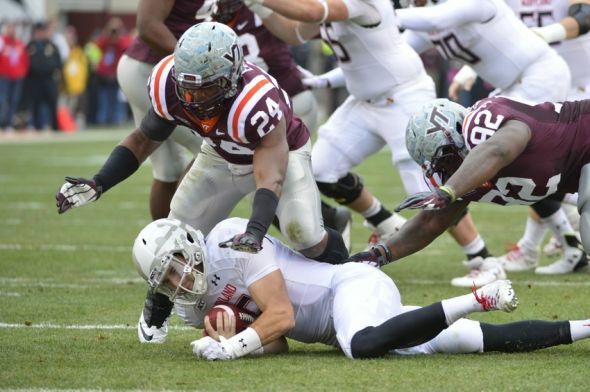 The Terrapins beat the Hokies in as 27-24 overtime victory. It was the last game the two schools competed against each other before Maryland's switch from the ACC to the Big Ten in 2014. Maryland holds a slight 15-14 edge over Va. Tech in the overall series between the schools, with the majority of the games having been played before World War II.